Avocado trees fare well in Texas, particularly in the Rio Grande Valley and southern Texas. Gardeners who want an avocado tree in their yard should plant the tree at least eight feet from the house so the tree will have room to mature. 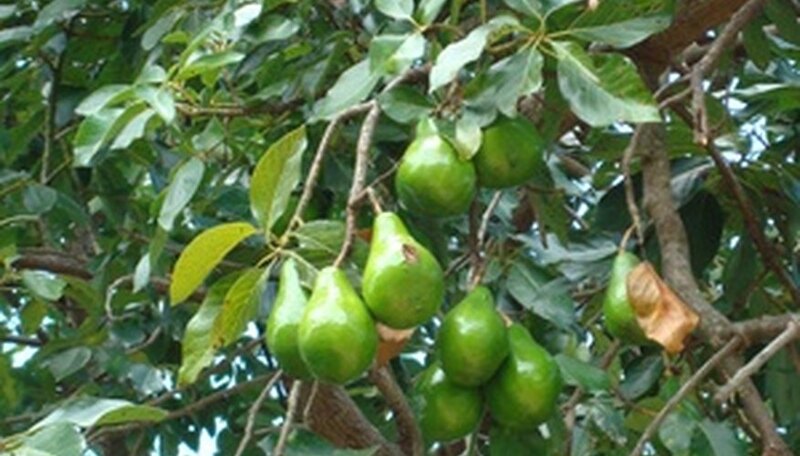 Avocado trees need full sun to produce fruit. Most avocado saplings will mature to produce fruit in two years, while avocado trees grown from seed take 10 to 15 years to produce fruit. Water avocado trees deeply and thoroughly. Soak the tree with a hose until the soil becomes thoroughly saturated with water. Then allow the soil to dry out slightly. When the soil is barely wet to the touch, water your tree again. Fertilize Texas avocado trees with ammonium sulfate (21-0-0) every month from February to September. For a one-year old tree apply 1/2 cup each month, increasing two 1 cup per month in the second year and 2 cups per month in the third. Thereafter, fertilize in February, May, September only and use 1 to 2 cups per inch of trunk diameter, split in thirds. So a tree with a six-inch trunk diameter would receive 6 to 12 cups of fertilizer, or 2 to 4 cups each time. Protect your avocado tree from frost by burying the trunk, a process called soil mounding. Submerge the entire avocado trunk under a mountain of soil to keep the trunk warm. Then string Christmas lights through the avocado tree branches and plug them in on cold nights. For added protection, wrap your avocado tree with a blanket when frost is forecast. Remove the avocado tree from its winter protection once the final frost date has passed. Prune trees annually in late winter once frost danger has passed. Use anvil pruners to remove dead or damaged wood. Strip away suckers from the trunk. Prune off branches that rub other branches or branches that grow vertically rather than out. Open up the tree's canopy to increase light and air circulation, which keep the tree healthy. Choose an avocado tree based upon your town's coldest temperature. Mexican avocados cannot go below 19ccccccccccccccccccc F. Guatemalan avocados can withstand a temperature of 26 F. West Indian avocados cannot tolerate any frost.